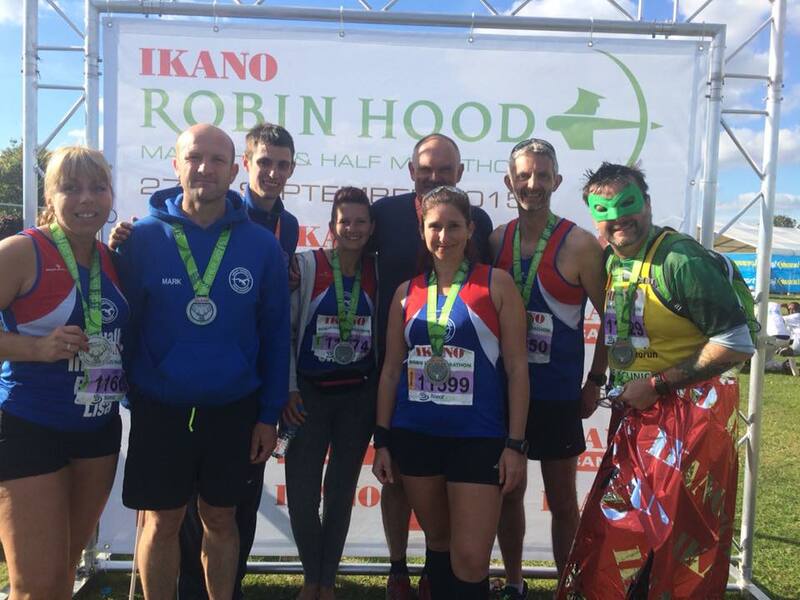 Great Yarmouth road runners continued their long distance running efforts for 2015 as a group of the Seasiders travelled to Nottingham to race the 35th running of the IKano Nottingham marathon and half marathon. Among the daring dozen that ran were experienced runners and first timers and all acquitted themselves well to what was a hilly and hot course for late September. There were 14,000 competitors and the half and full set off together in waves so chip timing was essential. First home in the half was Sean Jermy in a very creditable top 100 placing in a personal best time of 1.23. Following him were Andy Peck, Kerstin Langer and Mark Peach all very close together well under the 2 hour mark. Malcolm Holmes and Peter Spandler found the course tough but nevertheless beat their half marathon times that they had run 2 weeks previous in Budapest. The marathon runners ran the first 13miles with a lot of company and some were pleased to finally get going on the second half of the course. The scenic route passed through Nottingham centre more than once and took in the river and parks and lakes so plenty of spectators cheered the runners along. After working hard on his training Mark Mountains efforts really paid off as he smashed his PB and achieved a fabulous time of 3,49,16. Congratulations go to first timer at the marathon distance Gary Pillar who achieved a fantastic time even though he ran with an injury and ran through cramp near the closing stages. Karen Manning's marathon experience got her through this event and she finished 25 minutes slower than her Bungay marathon efforts back in April but will no doubt build on this for her ultra marathon she will be running in the new year. The club are very proud of the ladies who followed . Visually impaired Lisa Smith and her guide Jodie Lee ran fantastically well although somewhat disappointed with their time. Every run brings on new challenges and they helped each other. I am sure they will bounce back as they have other runs planned like Paris marathon and other endurance events for next year which I am sure they will tackle with gusto. Rachel Acamon-Carbenelli also smashed her London Marathon time set earlier in the year so was pleased with her efforts and I am sure will be back for another long distance event. As usual the Road Runners supported each other through each other's personal challenges. Full results, Seam Jermy 1.23, Andy Peck 1.53.18, Mark Peach 1.54.07, Kerstin Langer 1.54.18, Malcolm Holmes 2.13.02, Peter Spandler 2.33.53. Come along to the East Coast run 10k on Sunday 18th October where you will receive a warm welcome and plenty of support on your run.